Porter Davis has served in office and been a part of our grassroots network for many years. He is a senior statesman among us. He is a visionary and and activist and a believer. He is a gentleman’s gentleman, always gracious and lots of fun, but with a serious side too. He serves on our board for OKGrassroots. 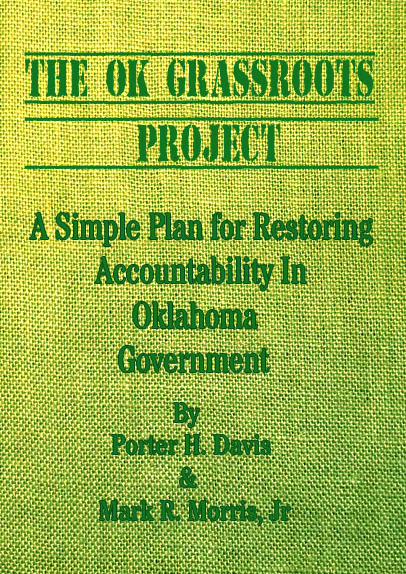 He has developed a very special project to help get the grassroots of Oklahoma get better organized and networked together. Here is the brief overview of the problem, the solution, and the strategy. The GOP is the majority party in Oklahoma, and growing. They offer the quickest and easiest way to achieve our goal. Work through the Democratic Party can also be effective, but they are in a distinct, declining miniority in Oklahoma. Party leadership at the Precinct, County and State levels will be chosen in 2015. We support candidates pledged to building the precinct structure we talk about.